Driving north along the length of the ‘Mainland’, through a treeless moorland landscape, we cross the line of latitude marking 60 degrees north, just 6.5 degrees short of the Arctic Circle. No wonder we are seeing northern birds like Arctic Skua and Arctic Tern, along with Red-throated Diver, Eider, Great Skua and a rare Velvet Scoter, plus Dunlin and Sanderling in breeding plumage. Meanwhile the ferry crossings from Mainland to Yell and Yell to Unst produce Fulmar, Shag, Gannet and Black Guillemot. Journey’s end is the UK’s most northerly hotel in Baltasound on Unst, where it is still light at 11.30pm! Today we take the ferry to Fetlar, and in the first bay on the south coast (Wick of Houbie) we spot a couple of Common Seals just offshore. As we watch their playful antics, they gradually approach to within thirty yards, ‘standing’ tall in the water to satisfy their curiosity and get a better look at us with their big dark eyes. Less than two miles down the road, the next bay (Wick of Aith) produces a pod of at least five dolphins, with arching grey backs and tall slender dorsal fins. Fetlar is home to most of the British population of Red-necked Phalaropes, and although the Loch of Funzie is the place to see them there is no sign of any when we arrive, so we have to make do with close views of Snipe, Redshank and Dunlin as well as a family of Wheatears with five recently fledged downy chicks and a Red-throated Diver, with a visibly red throat! After lunch by the loch and a stroll to nearby Funzie Bay, with a flock of ‘real’ Rock Doves, it is looking like we may miss the target bird, when suddenly two drop in to the nearest corner of the loch to show off in the scope, just in the nick of time, before catching the return ferry to Unst. Not far from the hotel is a bay called Harold’s Wick where we begin the day watching five Common Seals cavorting together and making a big splash just yards from the beach. Next stop is the Herma Ness National Nature Reserve, where we find Britain’s most northerly Lesser Whitethroat singing in the stunted bushes below the visitor centre! 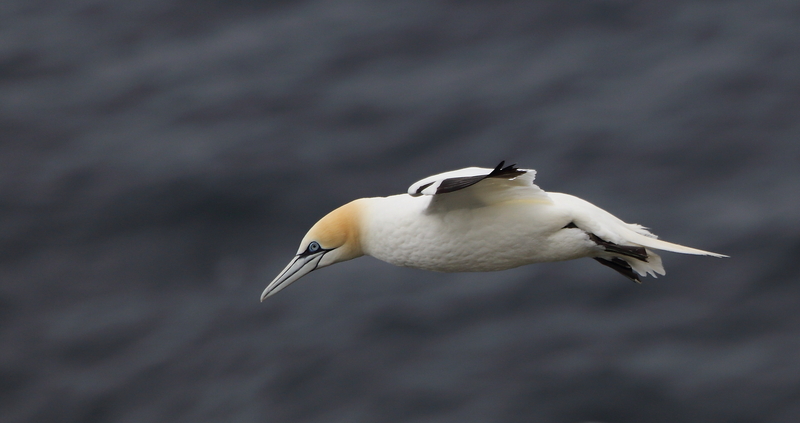 From here it is a walk of about an hour through ‘Bonxie Land’ to spectacular cliffs, stacks and arches, white with Gannets in their tens of thousands, a sight with a high ‘wow factor’. We enjoy a stunning view of the Muckle Flugga lighthouse and Out Stack, the most northerly point of the British Isles, and a long way from the Bishop Rock in Scilly where some of us have also birded together! 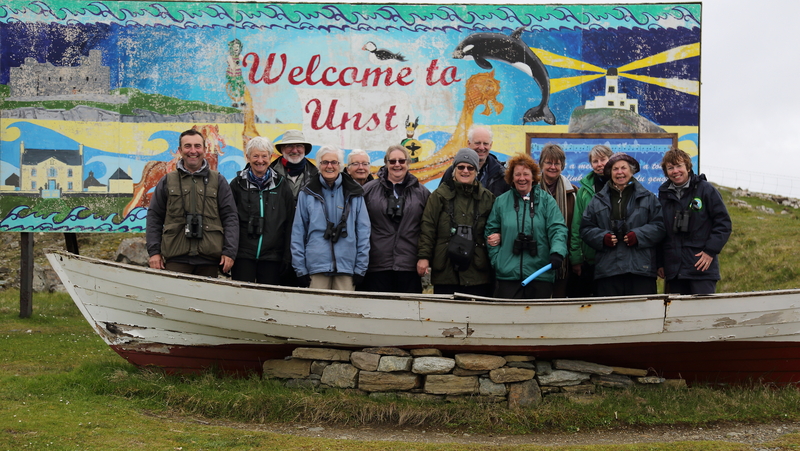 Having ‘done’ Unst and Fetlar, we retrace our route across Yell back to the mainland and head west to the lighthouse at Esha Ness, with another spectacular seascape and our first Kittiwakes of the trip. Despite a lot of searching we still need an Otter, and just like buses, you wait for one and then two come along! At Stenness on the Esha Ness peninsula, a particularly blonde Otter is out on the rocks between dives, plucking out various prey including crabs, sea urchins and fish. Shortly after it disappears behind the rocks another Otter pops up right below us, working its way along the rocky shore toward the point where the first Otter disappeared, where it poses on a rock while munching on a sea urchin. After 45 minutes of Otter watching we continue south toward Scalloway, where a brief stop at the Loch of Vatster, produces a scene reminiscent of the Arctic tundra, with a pair of Whooper Swans and five cygnets on the loch, and three Mountain Hares, with thick fur coats and white fringes to the ears, feeding in the heather. It’s 11pm on 20th June and the ‘simmer dim’ is at its peak as we set sail for Mousa. Once ashore the stone walls are purring with the strange calls of the tiny Storm Petrels nesting within the crevices. By the time we reach the massive stone broch which has weathered the storms for two thousand years, Storm Petrels are whizzing around the high walls like bats in increasing numbers, and by midnight there must be hundreds, showing best as they briefly cling to the walls before disappearing into their own private nest holes. Back at the boat at 1.15am it is still not properly dark. What an amazing experience. We have a well earned lie in this morning until 9am and then take the 10.45 ferry from Lerwick across to Bressay and on to Noss with an exhilarating Zodiac ride akin to the Special Boat Squadron! A Great Skua sitting outside the visitor centre emphasizes just how bulky these birds are, and with a mean looking eye and a sharply hooked beak, these brutes are not to be messed with. We arrive at the cliffs on the east side of the island in time for lunch with the Puffins. Further on the vertical cliffs of the Noup are plastered with tens of thousands of Gannets, while others cruise by at fairly close range, and Fulmars hang on the updrafts like puppets on strings. On the return path, the short turf is covered with the pink of Thrift and the blue of Spring Squill and we spot Dunlin, Wheatear, Ringed Plover and Arctic Skua. On our last full day we explore south Mainland, beginning with a walk across the breezy tombola to Saint Ninian’s Isle, the site of an ancient trove of buried treasure, hidden from the Viking raiders. Next stop is the Loch of Spiggie where new birds include Mute Swan, Grey Heron and a Corncrake, calling but invisible in the tall hay meadow. Last stop is Sumburgh Head with plenty of Rock Pipits and Guillemots, many with white spectacles, and a nice show by the very obliging Puffins.